Kevin was great – he answered all our questions and some we didn’t even know we wanted answered! Brooks/Cole, Cengage Learning, rrp $111.95. The short version of the review (presented below), will appear in the AITD journal, Training and Development (vol 39, no.3, June 2012). A longer version will appear in the Australian Counselling Association journal, Counselling Australia, (vol 11, no. 3, August 2012). This book is intended to clarify interviewing expertise through the use of the microskills hierarchy, communication skill units which include attending behaviour, the basic listening sequence, paraphrasing and reflection of feeling. It presents highly practical tools and resources, plus a large number of case examples and sample interviews in an engaging and easily understood format. The authors subscribe to the concept of what they term multicultural competence, resulting in a continual thread throughout the text which invites readers to examine their own and the client’s cultural position, wellness and world view and to reflect on how this affects the interview process. 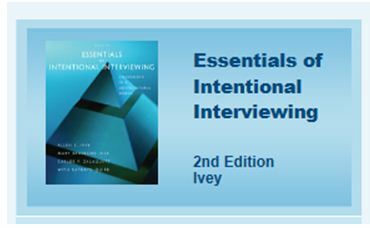 This text could be used to conduct successful interviews or counselling sessions for practitioners at all levels, however there is a particular emphasis on the needs of the novice or student. There is also the option of completing chapter specific quizzes and questionnaires online, and I found this a particularly useful way of embedding the learning. Along with providing a thorough background in the microskills framework and the five-stage interview structure for effective interviewing and counselling, this book makes a valuable addition to the library of anyone who wants to gain more communication skills —something we can all profit from.